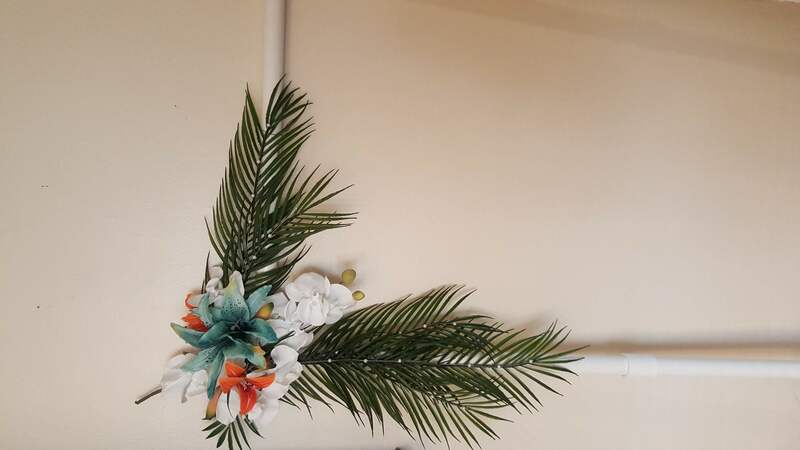 I was recently married on the beach and am selling my HUGE real feel silk arrangements for your outdoor beach tropical Hawaiian wedding reception party celebration backyard part or vow renewal. 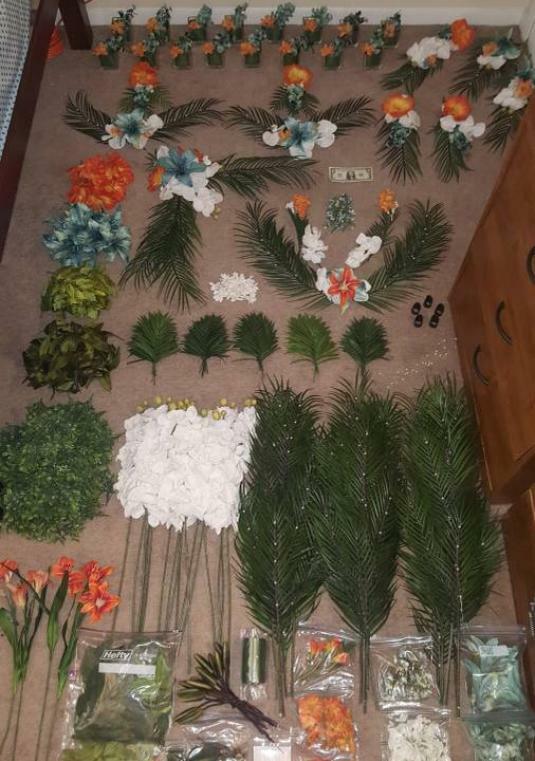 I hand selected, purchased & arranged my entire wedding ceremony & reception flower sets with items from Michael&#39;s, Hobby Lobby and a California supplier for the Hibiscus (NONE nearby in the tropical orange color). Many pieces are already hot glued & ready to display and leave you with almost nothing to worry about. 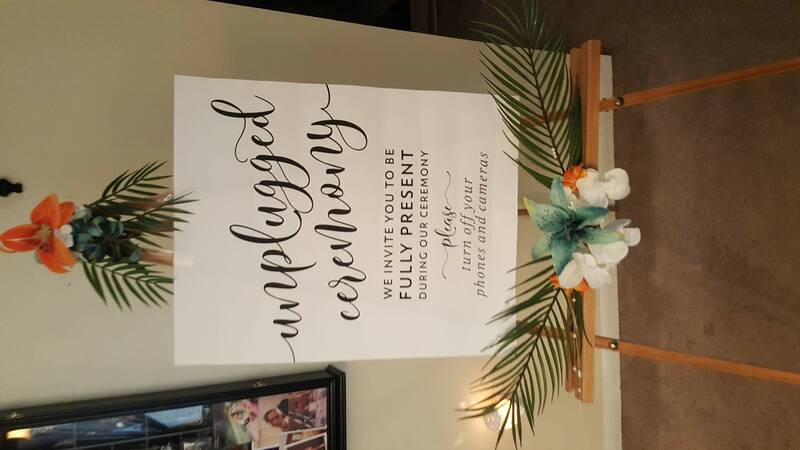 I have tons more pictures with instructions so all you have you do is set everything up. Please message me your email for more info. -Note- These flowers and arrangements are a GOOD SIZE. I put a ONE DOLLAR BILL on the floor in the first picture to show you the massive scale of how much is included...try to find it :) INCLUDED: silk flowers & decorated glass vase jars for 8 rectangle tables as pictured (or arrange how you&#39;d like), 1 head table (or sweetheart table) the wedding arch top corner piece (bamboo arch & lower side swag not included), 2 front reserved row corner seat accents, cake table, guestbook & gift table, seating chart easel, unplugged ceremony easel & lots of extras to make your own accents & bouquets. 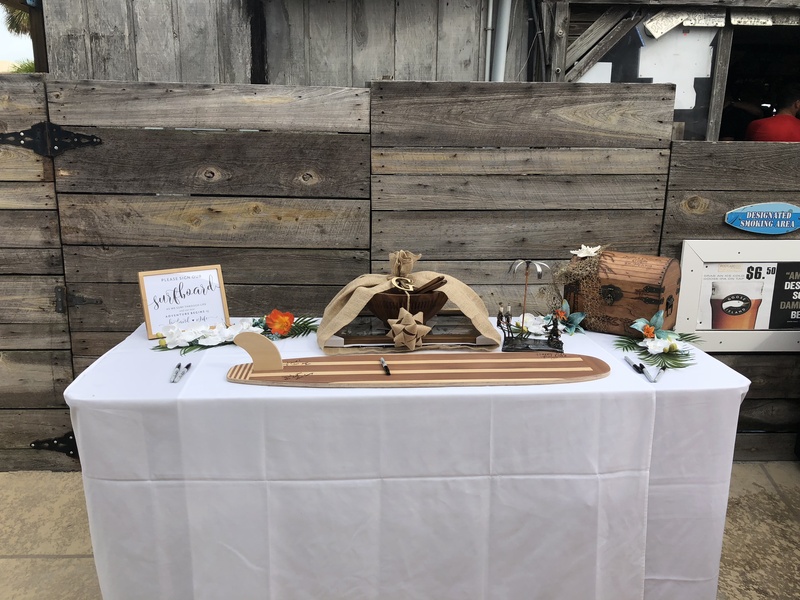 Two wooden standing &#34;A frame&#34; easels, 12 metal place holders, printable table numbers to 20 download, printable place card download unlimited number, printable seating chart download, cake flavor sign download, bar options sign download. 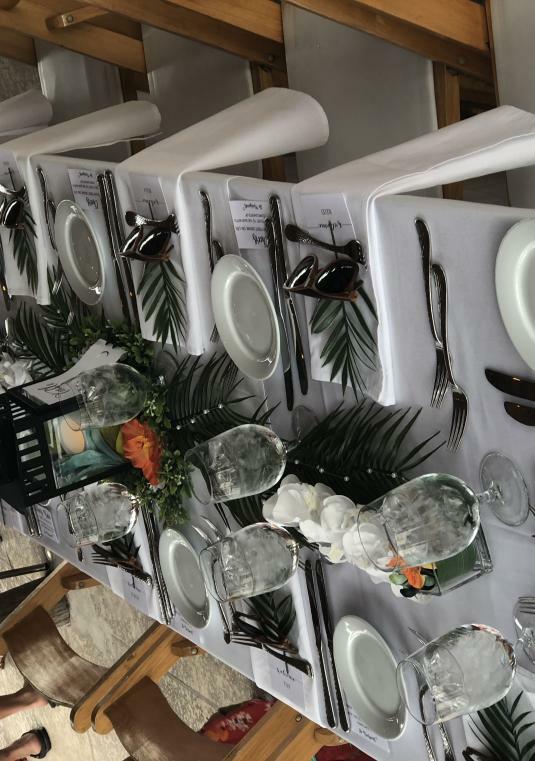 NOT INCLUDED are any of the bouquets or boutonnieres, any table lanterns, candles, place settings, surfboard, pic frames,napkins/glassware, tables, tablecloths, chairs, cupcake stand or sunglasses. 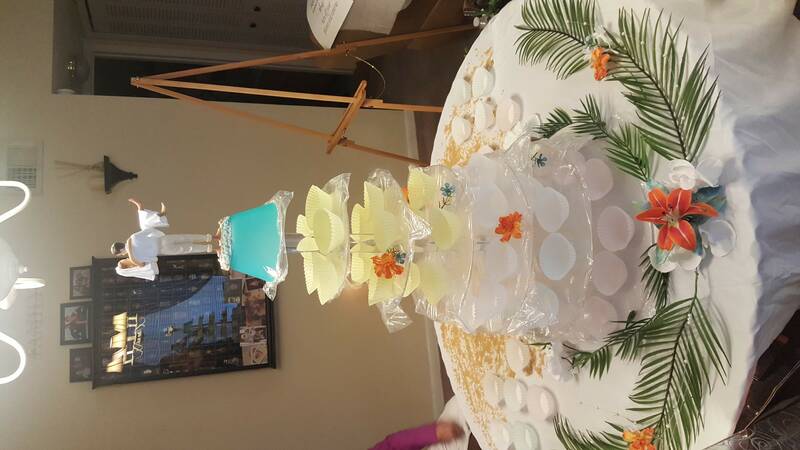 Real flower estimates were at about $3k with delivery. Save money and do your own thing! I will not break up into smaller groups. I can walk you through this & explain it all if you buy. I&#39;m very detailed. I may be willing to negotiate pricing, but living locally will have the biggest impact on this. Please message me with any serious inquiries so we can arrange a call. 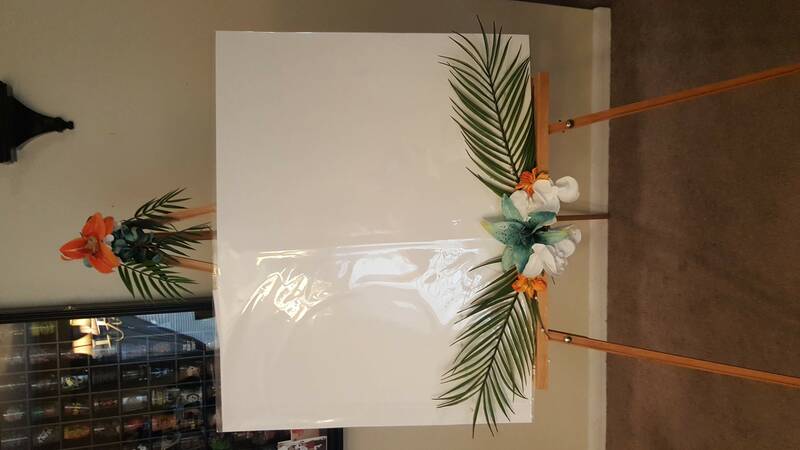 There really is SO MUCH included in this listing. 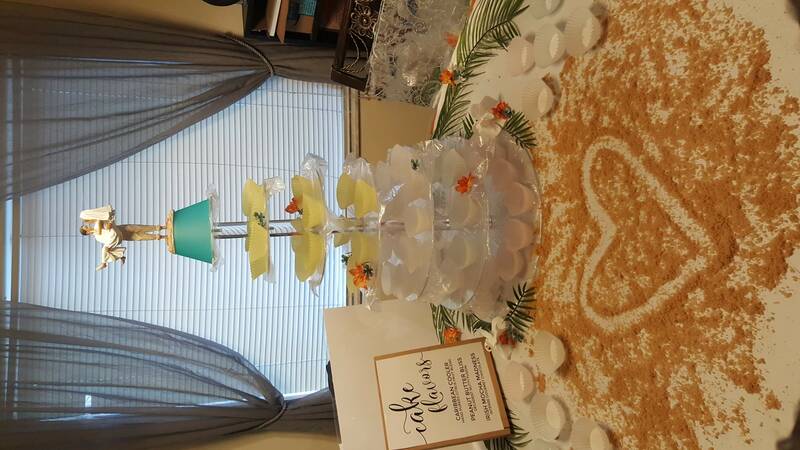 CONGRATULATIONS - You&#39;re getting married!